Camille and Ryan were married in September 2009. I actually met Camille in a scrapbooking aisle at Walmart! She was looking for a cardstock to match a ribbon, so that she could make her own invitations. We got to talking and in a week or so, I met with her fiancé Ryan (who, by coincidence, I went to elementary and highschool with him and his brother). 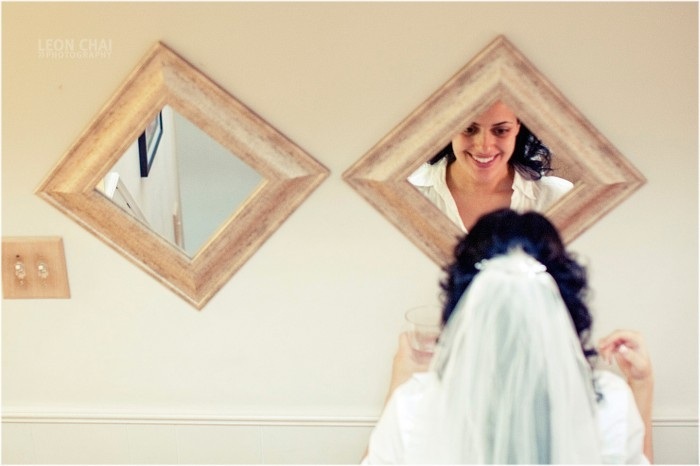 Camille was a big DIY bride! Everything needed to be and was perfect! She made her on invitations, cardbox and designed her own wedding cake to be made by someone else. 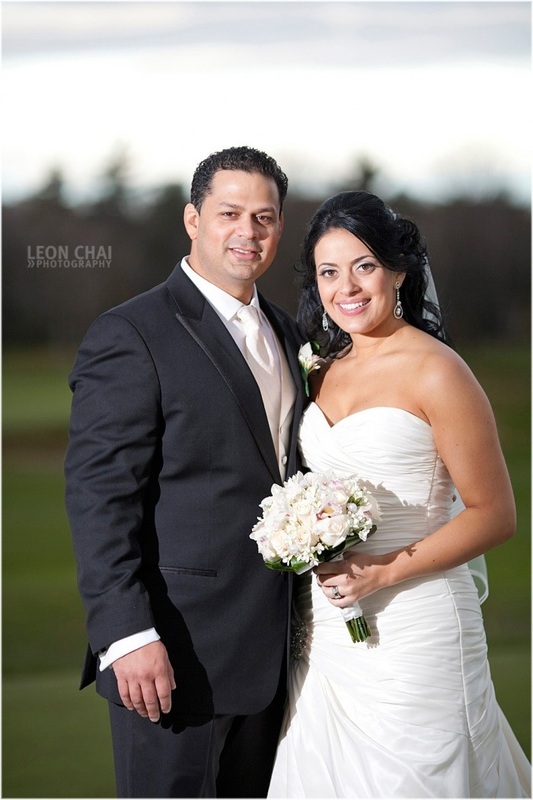 They got married at a church in Ajax followed by a reception at Le Parc Conference and Banquet Center. Their colours were pink, pink & more pink! Camille and Ryan’s reception was DJ’ed by Ryan’s cousin DJ Navi – he had the entire dance floor packed the entire night! 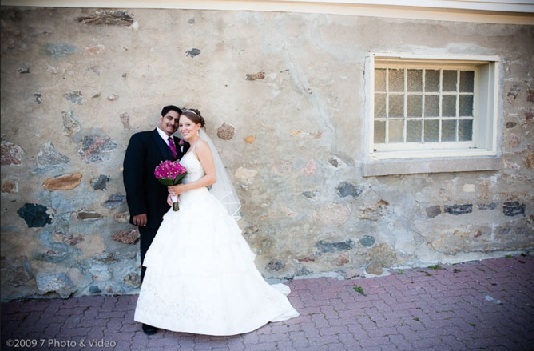 Today’s featured wedding is Sandra and Nick. Sandra and Nick hired Morganley for Month of Management services. I first met Sandra when she was a bridesmaid in Karena & Stan’s wedding. Sandra is probably the most organized bride I’ve ever had! 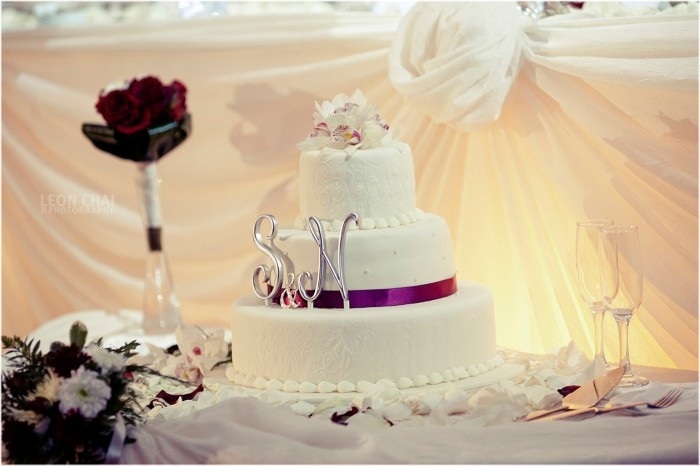 She knew everything she wanted and made it happen and as a result their wedding was gorgeous! Upon signing with Morganley, Sandra and Nick were told that the week prior to their wedding, their coordinator would be away at a conference with limited phone and email communication. They were strangely calm about this! That’s how cool this couple is! We made sure that all details were completed before the conference. Doing so made sure that Sandra and Nick had the down time to relax and not think about anything wedding related the week before! During the time that their coordinator was at the conference, during email communication Sandra had told the coordinator – stop emailing me, go enjoy the beach, everything’s fine! THAT is what makes me so happy to be a part of someone’s wedding day! To get something so simple as a thank you, makes you know as a wedding coordinator you’ve done an amazing job at making their day special! 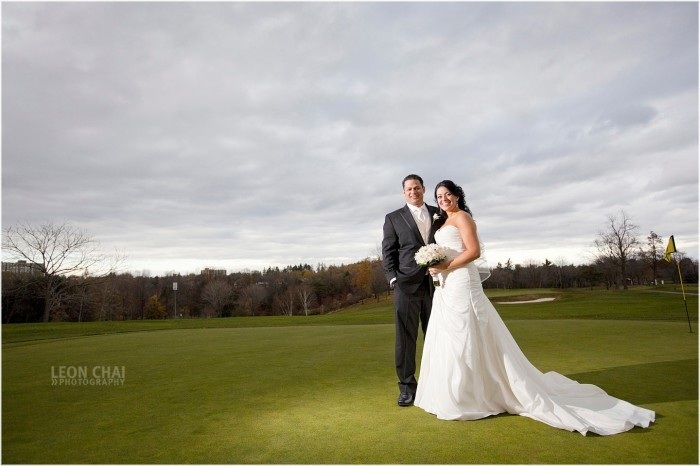 After the ceremony, the bridal party and family were off to Scarborough Golf & Country Club for photos with the amazingly talented and one of my favourite photographers: Leon Chai. Cocktails and Reception took place Riviera Parque Banquet Convention Centre. 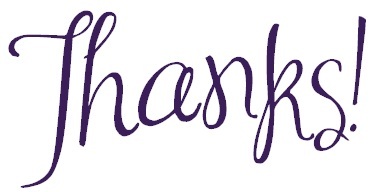 The staff here was so helpful, accommodating and organized! I even got to sit down with the banquet manager at the end of the night for a little chat. 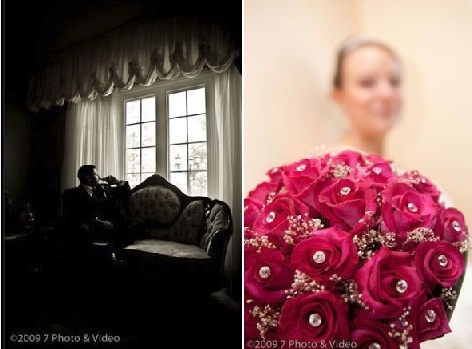 (How often does a wedding coordinator & banquet manager have time to do that??) The room was so beautifully and simply decorated by Luxel Decor. 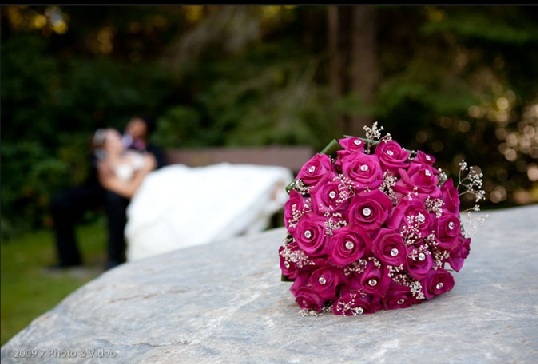 The centerpieces were designed by the bride and groom and created by Morganley’s Wedding Coordinators that day. The bride and groom were speechless when they walked into the hall for the reveal! It really was stunning! The dinner was delicious, the bridal party put together some amazing speeches and the party rocked on into the wee hours of the night by Prodigy Entertainment. Thank you to Morganley’s assistants, Megan, Janis & Diane and all of the fabulous vendors Sandra and Nick put together to create this perfect day. Thank you, Sandra and Nick! On October 18, Morganley participated in Vaughan’s Welcome Wagon Bridal Showcase at Borgata Event Venue. This was Morganley’s very first bridal show, so I was very excited! I designed my own table using linen I owned and rented from Chairman Mills, purple Christmas decor from last year and some new items I purchased! Purple and bling were everywhere! Lataysha (WPIC intern) was helping me for the night! She was fantastic! Although many couples who came to our table thought we were decorators (I guess we did a great job), we had a lot of interest in Wedding Planning/Coordination services. We are starting to fill up for the 2012 season! 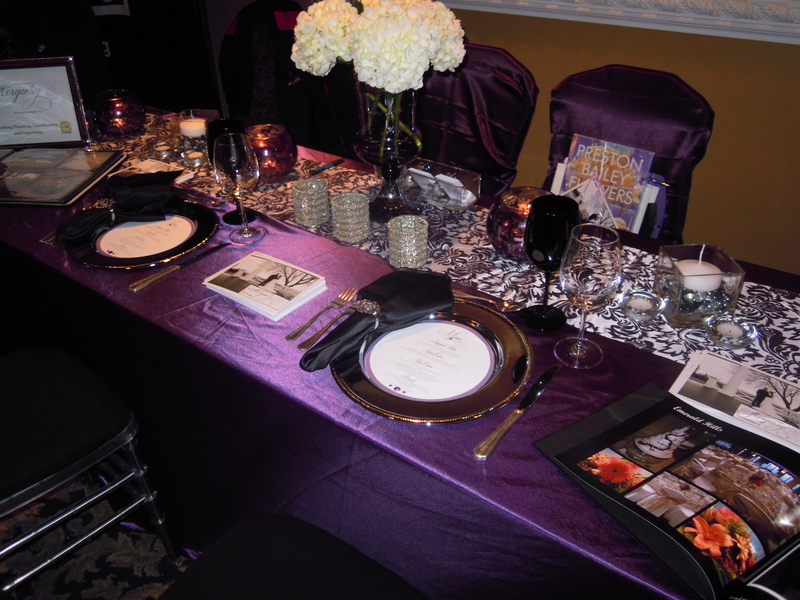 The table was adorned with a purple satin linen, with ice chivari chairs. I had purchased silver/chrome charger plates and created round menu cards that would fit inside the charger. There was purple vases and candle holders mixed with some bling! Portfolios sat out on the table for couples to look at. Overall it was a great night. We learned a lot, met some great people and can’t wait to do another show! Thanks to Lataysha for all of her help!